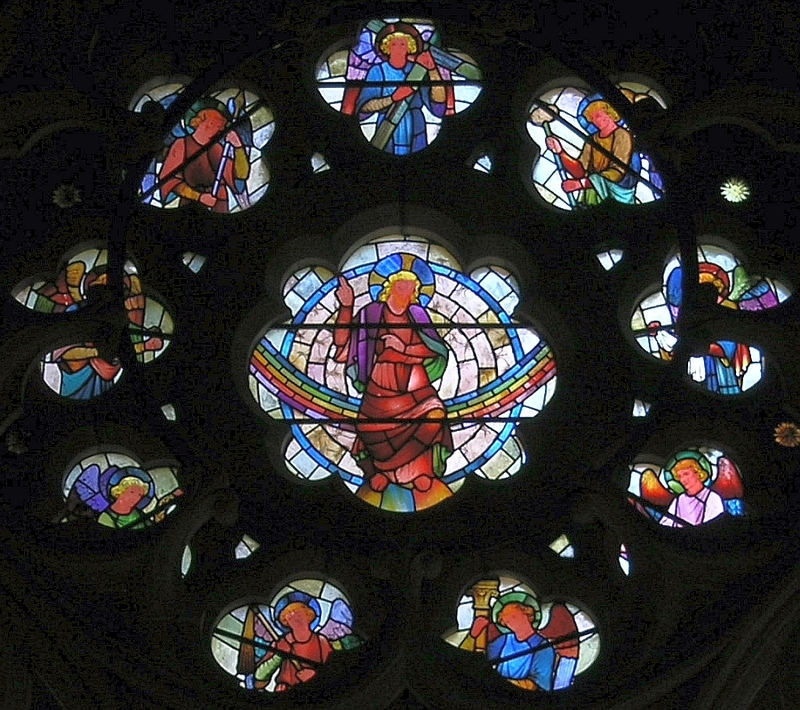 The East Window of Christ the Consoler, Skelton, by Horatio Walter Lonsdale (1844-1919). c.1876. Surrounded by angels, the figure of Jesus presides over scenes from the Bible. Note the outline of James Redfern's reredos at the bottom of the picture. Christ the Consoler is one of two sister churches in North Yorkshire designed by William Burges, for the decoration of which the architect used his usual highly skilled team of craftsmen, including stone-carvers Thomas Nicholls and Redfern, and the artist Frederick Weekes (1833-1920), son of the sculptor Henry Weekes. Lonsdale was an important member of this team. The design might be agreed by both Burges and Lonsdale, sketched in detail by Lonsdale, passed on to Weekes for cartooning, and finally sent to Saunders and Co. for making up (see Crook 101). Since even Gilbert Saunders had started his career with Burges, there was a close understanding among the different contributors. The result here, as elsewhere, is an "uncommonly excellent scheme throughout" (Leach and Pevsner 701). 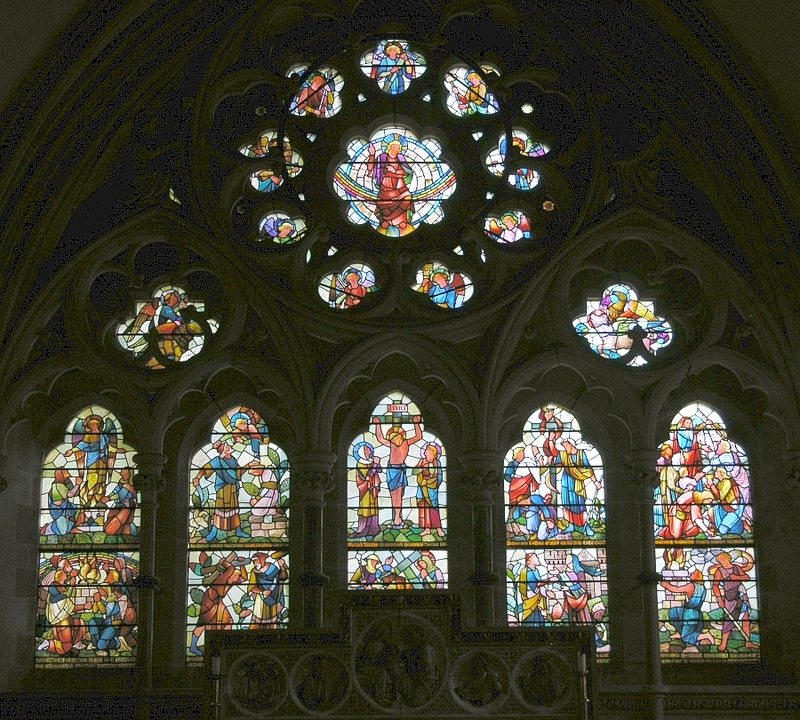 Scenes from the east window. 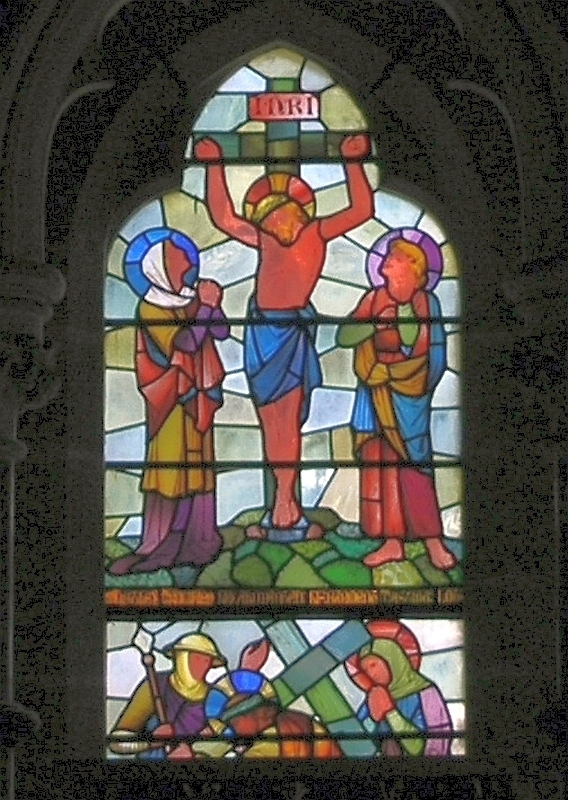 Left: The Crucifixion. 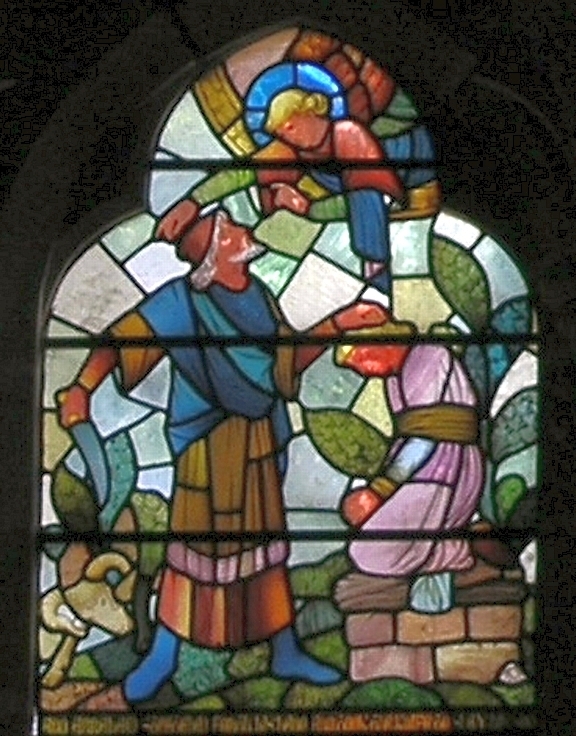 Right: Abraham is told that he need not sacrifice his son Isaac. "Behold, behind him a ram caught in a thicket by his horns": this will be offered as a substitute sacrifice (Genesis 22, 13). As everywhere, Lonsdale's design work is marked by "intricacies of draughtsmanship" and the choice of "vivid and pure" colours (Horatio Walter Lonsdale 5). Crook, J. Mordaunt, et al. The Strange Genius of William Burges, "Art-Architect," 1827-1881. National Museum of Wales and Victoria and Albert Museum Centenary Exhibition Catalogue, 1982. Horatio Walter Lonsdale, 1844-1919: Architectural Artist (Exbibition Catalogue). London: Gallery Lingard, 1984.